The Red Sox have five All-Stars. If this was another season with a less-impressive group of American Leaguers, they could conceivably have even more. These guys aren’t flukes, either. This is a team that could be filled with potential All-Stars for the next half dozen years. That is, as long as they can keep them all. There is a large group of players on the team who have expiring contracts in the next three years and who will demand large new deals from the Red Sox. The list includes the likes of Craig Kimbrel, Drew Pomeranz, Joe Kelly (this offseason), Rick Porcello, Chris Sale, Xander Bogaerts (next offseason), Jackie Bradley Jr. and, most notably, Mookie Betts (in two offseasons). David Price could also opt out after this season and J.D. Martinez said that he would be open to restructuring his contract. This is a huge list of guys that the Red Sox will want to resign. Not everyone on the list will be a returning target for the team, though. For example, it’s easy to see them not even making an offer to Pomeranz this offseason. But when it comes to players like Kimbrel, Sale, Bogaerts and Betts, those are the type of players that don’t just come around every day. Kimbrel is one of only two active players on the top-20 all-time saves list. He’s a seven-time All-Star, finished in the top-10 of the Cy Young voting five times, won the Trevor Hoffman and Mariano Rivera awards and was the Rookie of the Year in 2011. This season, he has a 1.77 ERA and 30 saves. Sale is also a seven-time All-Star – including three straight starts – with a top five Cy Young finish ever year since 2013. This season, he has been worth 5.6 bWAR. He’s had two seasons of over 270 strikeouts, including 308 last year and a league-leading 188 so far this year. By the time his career is over, he will have climbed high on the all-time strikeout list. Bogaerts is a former All-Star and a two-time Silver Slugger Award winner. He even contributed to the 2013 World Series championship as a 21 year-old. This season, he’s put himself back into the conversation about the American League’s best shortstops. He has done this largely because of his production in high leverage situations, where he is hitting .348 with five homeruns, 33 RBI and a 1.115 OPS. Betts is in the conversation for best player in baseball, with his third straight All-Star appearance. He has also finished in the top-10 for MVP voting twice, to go along with his Silver Slugger and three Gold Glove Awards. His overall awesomeness and value cannot be overstated. So when J.D. Martinez says he’d be willing to restructure his contract for more security, it’s a little bit scary. Because along with the extra security comes more money given to him. And the more money given to him, the less there is to go around for all of these other guys. This year is a year that is full of hope and opportunity for this team that leads the Majors in wins. Obviously, this year and everything that it holds is the focus. But the future has to at least be in the back of the minds of the higher ups for the Red Sox. The Red Sox have to be thinking along a similar wavelength, though some of the bridges are closer to their faces than to the horizon. 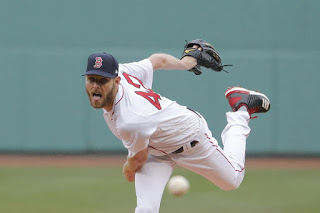 Chris Sale and Craig Kimbrel are both on expiring contracts and they are not the type of players the team can afford to lose, with their organizational pitching depth being so thin. But again, these bridges can be crossed in time. Dave Dombrowski can be trusted to make the right calls on what players can be pursued and John Henry is willing to spend if the cost is winning. He’s shown it before and he should be ready to show it again.